The tech industry has a race problem. There, we’ve gotten to the point rather quickly and it is not a secret. There have been multiple studies, articles, and discussions about race and the technological industry, particularly diversity and representation of minority groups or lack thereof. Looking at statistics, tech is dominated by the white, male demographic, and this has been the status quo for as long as the industry has existed. There have been a number of reasons cited as to why this may be the case. 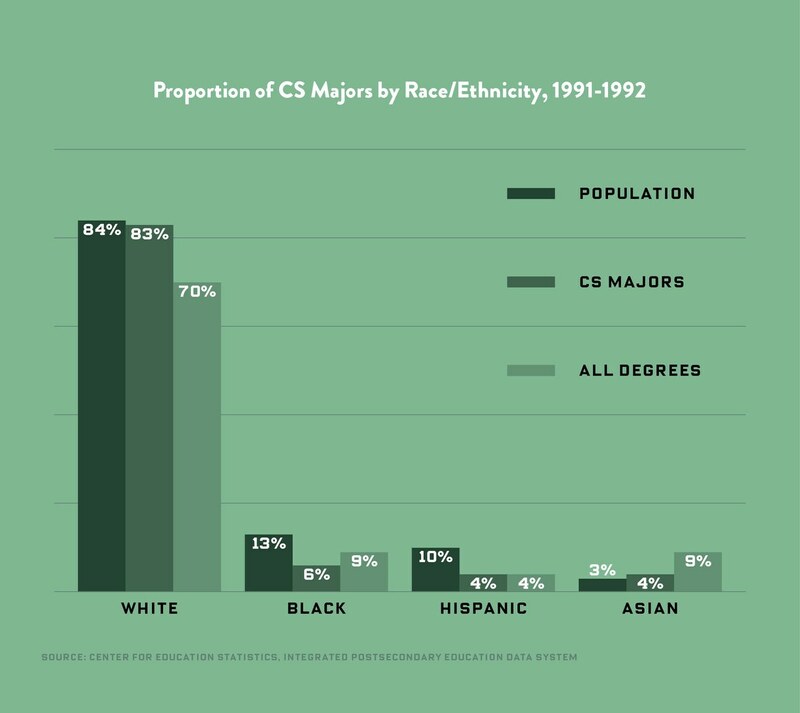 For instance, in the early 90s, one major factor for this discrepancy was the lack of minority groups majoring in computer science. However, that has since changed. 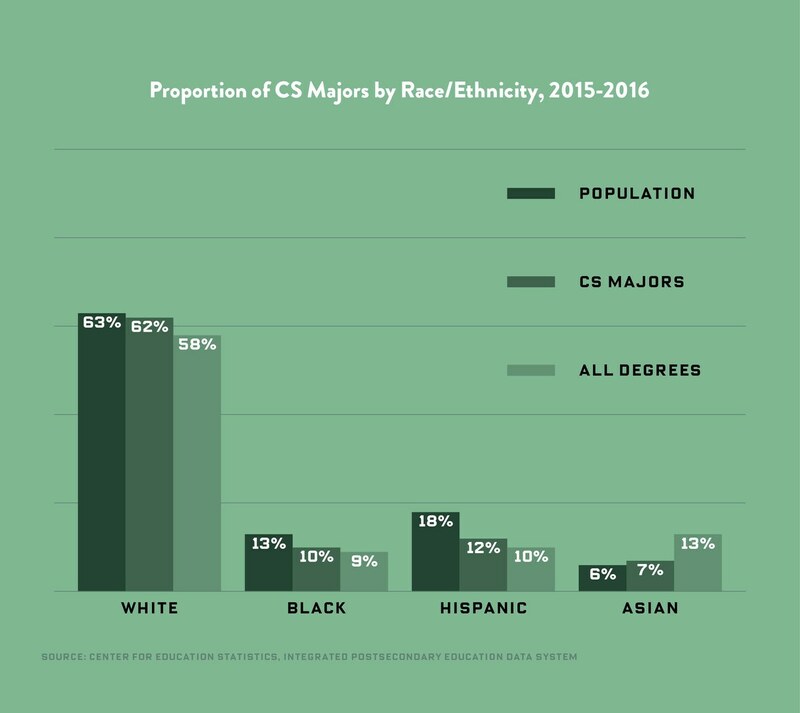 More recently, the number of computer science graduates who are white has decreased, while other minorities groups have increased. With the most significant change occurring among the Hispanic/Latino population. Proportion of Computer Science Majors by Race/Ethnicity 1991-1992 vs. 2015-2016. But it is not enough to look at the education system alone. Another, factor to consider when looking at the lack of minority representation in technology is related to the culture and attitudes of those already occupying the space. In a report by the online IT publication, Tech Republic, a 2017 study revealed that unfairness and mistreatment was the number one driving force behind tech companies turnover rates. What’s more, turnover costs these companies over $16 billion a year, while advocating and promoting diversity could increase net profits, potentially, to $400 billion annually. In short, inclusion is not only good, but it is also profitable! So, why don’t we see more minorities in technology? This is the question that has plagued the mind of Luc Ibata-Okalobe, 38, a DevOps Engineer residing in the San Francisco-Bay Area. Born in the Republic of Congo and educated in France, Ibata-Okalobe has found a way to marry his skills in technology and his passion to resolve social issues using the brainstorming event known as a hackathon. Founder of ThonX, Luc Ibata-Okalobe. Image provided by Luc Ibata-Okalobe. Hackathons, a term coined in 1999 for the first of such an event founded by John Gage, originally referred to an event where developers, programmers, and all those in related fields would come together to work in teams to address a subject or an issue. In this case, the term “hack” refers to exploratory programming used to solve a problem. Think of all those “life hack” memes you see floating in your newsfeeds – they solved a problem you didn’t even know you had until the meme popped up! Yet, it should be pointed out that the expectation at a hackathon is that teams go beyond the brainstorming, or ideation, and planning phases to full-on development and implementation of an early version of their program or application that can be used right then and there. While hackathons were originally seen as computer science/technology based events, Ibata-Okalobe has taken the notion and expanded it to be inclusive to all those who simply want to help and make the world a better place. In other words, you do not have to have a technologically-based background to be a part of his hackathons. You just have to care. Recounting a story about a cousin back home in the Congo, Ibata-Okalobe shared how this relative reached out to him for monetary assistance. However, “I’m against sending people money because it never ends,” he shared. So, instead, he wanted to provide a solution to the problems that plagued his home country and, thus, the cause of a recession affecting his family. His skills, however, were in coding and app development, and he questioned how his skills could help resolve such a large issue. Instead, Ibata-Okalobe downscaled and decided the best way to help with one large, glaring problem, was to tackle as many small problems as possible. Hackathons allow people who have never met before to come together and ideate resolutions to an issue or address a subject. Photo by rawpixel.com from Pexels.com. “But there are so many problems in my country! I needed a hundred apps,” he laughs, “Okay, I need to build a hundred apps. So I reached out to my friends, and it’s just too much. Nobody can do it for free. So what is the place where you can have other people creating a hundred apps?” His answer… a hackathon. This was the birth of Ibata-Okalobe’s first hackathon, organized and sponsored by himself, A Hundred Hacks for A Hundred Problems in Africa. Held on November 18, 2017, also his birthday, only 15 people attended. The winners of this first hackathon developed an app that made it easier for money to be transferred between French residents and their relatives in Africa, while also ensuring that money is used only on necessary goods and supplies. They went on to have their project funded and have raised as much as $800,000 for their startup. And it all began from an idea developed at a 24-hour hackathon with a group of strangers who knew nothing about each other until that day. But for Ibata-Okalobe, this was enough to spark a fire of hope that would inspire him to continue to use hackathons as a way to resolve social and world issues. Encouraging more black people and people of color to attend schools and study computer science fields. Showcase and promote talented minorities in the media to chip away at the idea that tech is a “white man’s” world only. Bridge the gap between ambitious people of color looking to develop their own startups and the investors out there seeking new, profitable opportunities. The last goal being of particular importance to Ibata-Okalobe, he highlights it in his presentation for ThonX, which points out that entrepreneurship in technology, i.e. start-ups, is hindered by bias. Investors, who are also overwhelmingly white and male, tend to invest in the start-ups of those who resemble them: white and male. It creates a revolving door for those who are allowed access and effectively keeps out those who do not meet this demographic, such as women, Black people, Hispanic/Latinos, etc. Ibata-Okalobe contends that this leads to, “a whole lot of the same ideas over and over again,” and insists that investing in diversity and seeking out skilled people in other demographics, could present profitable opportunities to these investors… remember that $400 billion, annually tech companies keep missing out on? ThonX, the brainchild of Luc Ibata-Okalobe. This is his most ambitious hackathon yet. Image provided by Luc Ibata-Okalobe. But how do you get these underrepresented groups in front of investors? “Removing the gatekeepers to access and opening up, that’s when things [are] going to happen,” Ibata-Okalobe states. With ThonX, and in partnership (though they are still in talks) with UC Berkeley, Ibata-Okalobe plans to develop a hackathon program open to all those who wish to participate. His grandest design is to develop it as an online hackathon, which would allow international access. Teams could work together in this digital sphere to resolve the issue/theme of the hackathon. Working online would allow more people from all walks of life to participate, without necessarily having to travel to the Bay Area, and it is Ibata-Okalobe’s hope to include tech-minded participants as far as Africa to join in the event. Using media coverage, Ibata-Okalobe plans to showcase the talents of these participants for the world stage. Effectively, throwing them in the path of potential investors and other interested parties. All the while, showing the world that there is more than enough room for other demographics to take a lead in the technology industry. Meanwhile, for UC Berkeley, their goal is to increase diversity on their campus and in this field of study. So, their participation in the project would encourage more minorities to study computer science and would put UC Berkeley at the forefront of these potential students minds for university choices. From all sides and for all parties, ThonX appears to be a win. However, for Ibata-Okalobe the real win is in using a hackathon to create opportunities for black people and other people of color to get a foot into the door of tech. “I call it [a hackathon] the marketplace of opportunities,” he states. Hopefully, through his passion for resolving social conflict and through the joint efforts of the ThonX project, Ibata-Okalobe can recreate that moment of positivity and excitement for a new generation of young, talented, people of color participating in his grandest hackathon yet. And in this way, open access and diversify the world of technology. ThonX is still in its planning stages. Updates are still to come, so make sure to come back and follow this ongoing project here at Taking Up Space and be sure to share your thoughts about this post below in the comments section. Awesome. This is a great article, well done.. That’s the most incredible idea I ever heard about, after Facebook 12 years back when I was student. Facebook looked so awkward, so different and so promising for me when I encountered that at the beginning. So did ThonX for me when I encountered that first time. I will definitely watch this space. And hopefully, Luc succeeds his ambition as this is so meaningful for many people. Thank you for taking the time to read the article and for sharing your own experience. I am just as excited to see where this project goes as you are! Here’s to wishing the best for Luc and ThonX.